Syria's Assad Admits Setbacks In Civil War, But Vows To Win : The Two-Way Speaking in a televised address in Damascus, Assad promised: "We will resist and we will win." 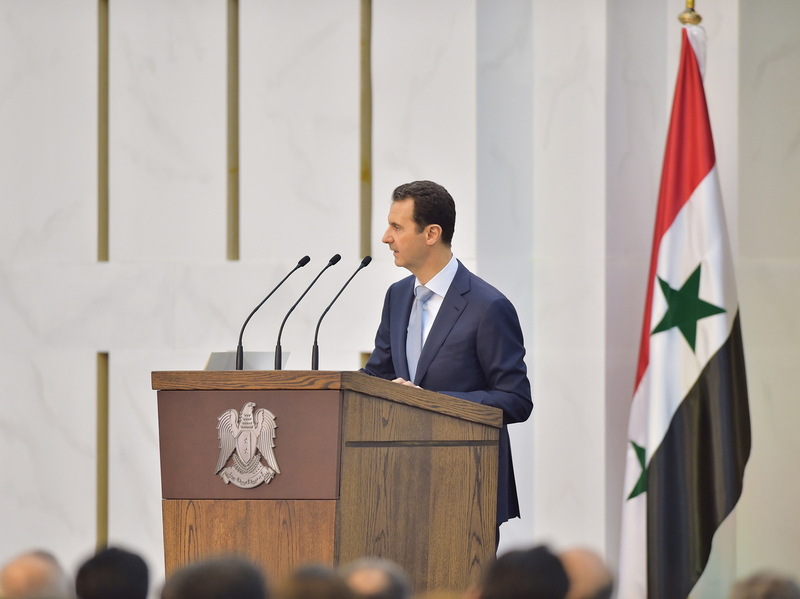 Syrian President Bashar Assad speaks during his meeting with the heads and members of public organizations and professional associations in Damascus, on Sunday. Assad acknowledged that the fight against rebels had suffered setbacks, but vowed to win against insurgents. Syrian President Bashar Assad, in his first public address in a year, acknowledged that government forces had lost territory to rebels and needed more troops, but he vowed to crush the insurgency that has threatened to topple him. Assad admitted that his generals have had to shift forces from one front to another to defend key territory and that the loss of some areas have caused "frustration" among ordinary Syrians. Is Bashar Assad Just Losing Some Ground ... Or His Grip On Power? "Sometimes, in some circumstances, we are forced to give up areas to move those forces to the areas that we want to hold onto," Assad said in the televised speech to local dignitaries in Damascus. "We must define the important regions that the armed forces hold onto so it doesn't allow the collapse of the rest of the areas." However, he insisted that: "We are not collapsing. We are steadfast and will achieve victory." "Defeat does not exist in the dictionary of the Syrian Arab army," he said, vowing: "We will resist and we will win." "Syrian forces have suffered several setbacks since March, including the loss of the northwestern city of Idlib, the capital of a province that borders Turkey. In May the government lost the historic central town of Palmyra to IS extremists, who also captured parts of the northeastern city of Hassakeh. "Those losses could be partially offset by greater support from the government's key ally, Iran, now that Tehran has agreed to a nuclear deal with world powers that would see international sanctions lifted."